1. Prepare Marinade: In blender or food processor with knife blade attached, pulse all ingredients, except 1/4 teaspoon salt and oil, until garlic and chile pepper are chopped. With blender or processor running, drizzle in oil and process until well combined. 2. Prepare Kabobs: Place beef in large zip-top plastic bag. Pour 1/2 cup marinade over beef. Seal bag and refrigerate 2 to 6 hours to marinate. Refrigerate remaining marinade. 3. If using wooden skewers, soak in water 10 minutes. Prepare outdoor grill for direct grilling over medium-high heat. In large bowl, toss mushrooms, onions, bell peppers and zucchini with 1/4 cup remaining marinade. Remove beef from marinade; discard marinade. Alternately thread beef and vegetables onto skewers; sprinkle with remaining 1/4 teaspoon salt. 4. Lightly oil hot grill rack. Place kabobs on hot grill rack; cover grill and cook 8 to 10 minutes or until internal temperature of beef reaches 145° for medium-rare (10 to 12 minutes or 160° for medium; 12 to 14 minutes or 170° for well-done), rotating kabobs every 2 to 3 minutes. 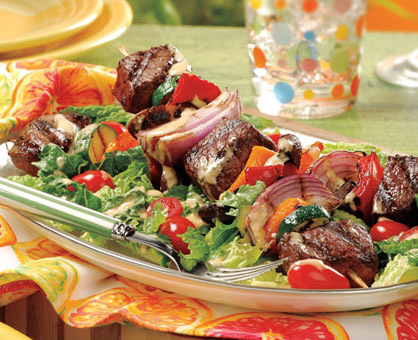 Serve kabobs over lettuce and tomatoes drizzled with remaining marinade. When handling a chile pepper such as a habañero, make sure you wear gloves while cutting the pepper and thoroughly wash your hands afterward. Time-Saver: Use your favorite bottled vinaigrette for marinating beef and drizzling over salad.